Note: I must first apologize for the lack of posts lately. I have started teaching AutoCAD for a local community college at night and it has been very demanding of my time. Teaching this class should help me focus on some of the more fundamentals of AutoCAD that I have usually not bothered to post here on the blog. These fundamentals are a good reminder for all drafters at any level so I think that covering these topics will be a good thing. “When a command prompts you for a point, you can use the pointing device to specify a point, or you can enter a value on the command line. 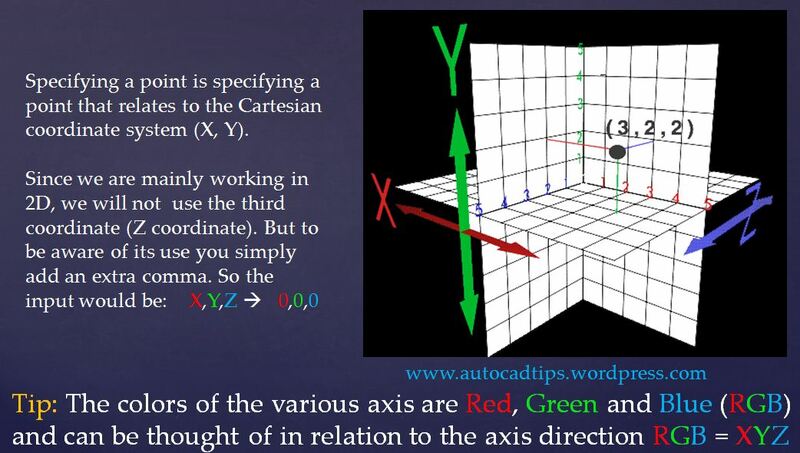 You can enter two-dimensional coordinates as either Cartesian (X,Y) or polar coordinates. A Cartesian coordinate system has three axes X, Y, and Z. When you enter coordinate values, you indicate a point’s distance (in units) and its direction (- or +) along the X, Y and Z axes relative to the coordinate system origin (0,0,0). In 2D, you specify points on the XY plane, also called the construction plane. The construction plane is similar to a flat sheet of grid paper. 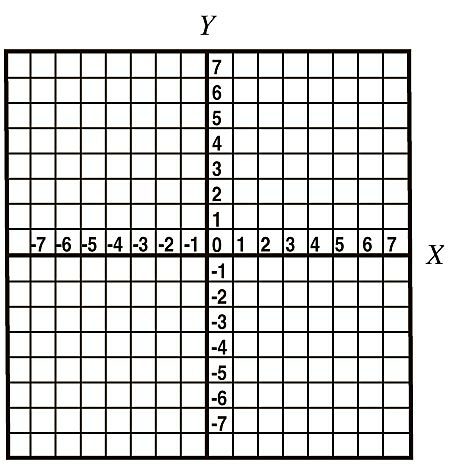 The X value of the cartesian coordinate specifies the horizontal distance, and the Y value specifies the vertical distance. The origin point (0,0) indicates where the two axes intersect. Absolute Coordinates let you type in a specific X and Y location on the construction plane. 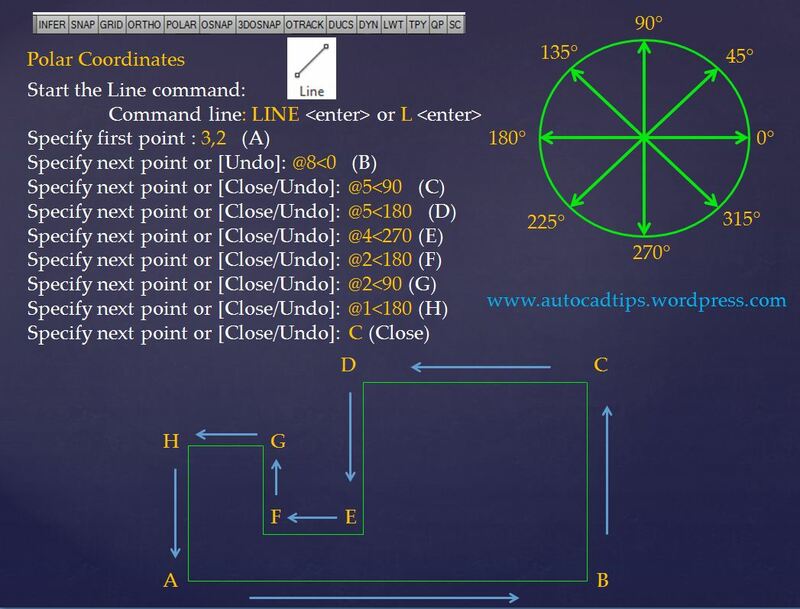 Use the picture below to work through the use of using absolute coordinates to create the shape that is shown. Note that the coordinates that are shown in the lower left of the screen (status bar) displays the coordinates of your cursor. Note the all of the Drafting Setting toggles are turned off. this is because when DYN (dynamic input) is turned on it changes how absolute and relative coordinates are entered. 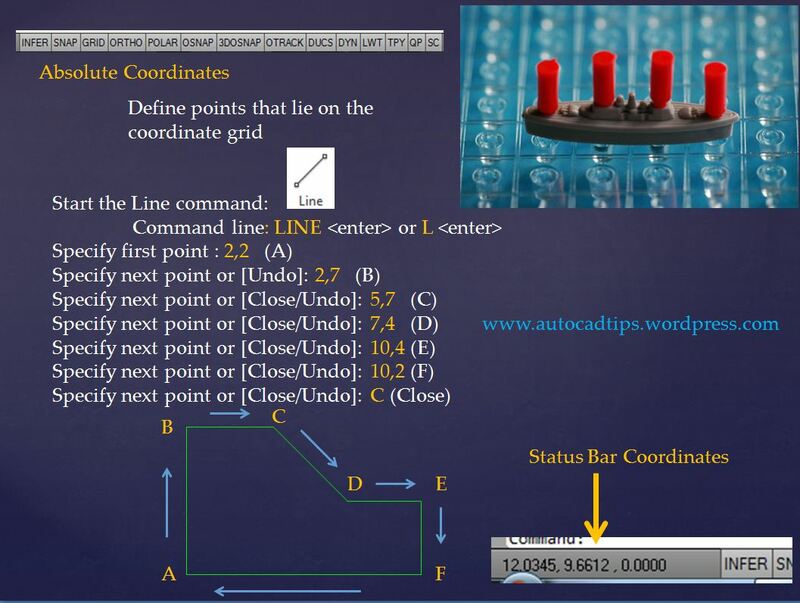 Relative Coordinate entry is simply specifying the next point as it relates to your previously defined point whether you picked a point with the cursor or you entered a specific coordinate. Think of this method as the last point you specified being equal to the coordinate 0,0. 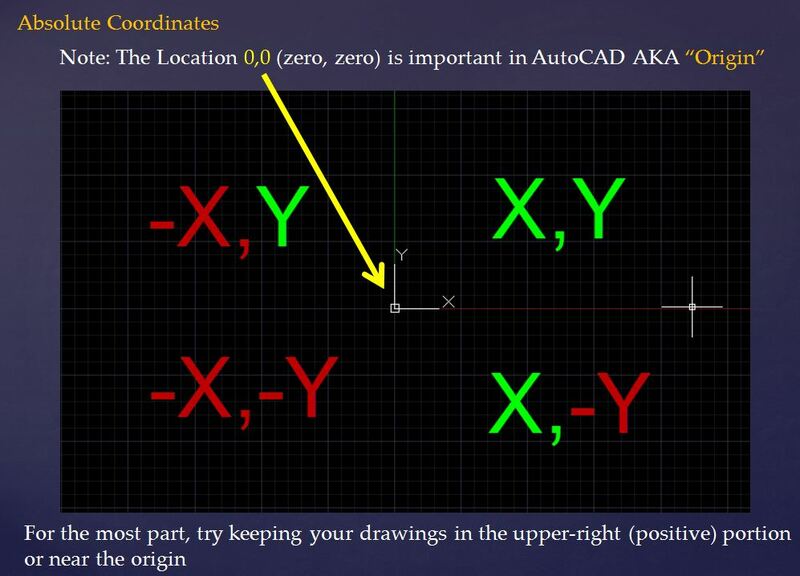 The way that you tell AutoCAD that you want to use relative coordinates is that you prefix the coordinate with the @ symbol. Note that the first point that is specified is an absolute coordinate since there is not a specified previous point. Relative Polar Coordinate entry is very useful but for some people it is easily forgotten. 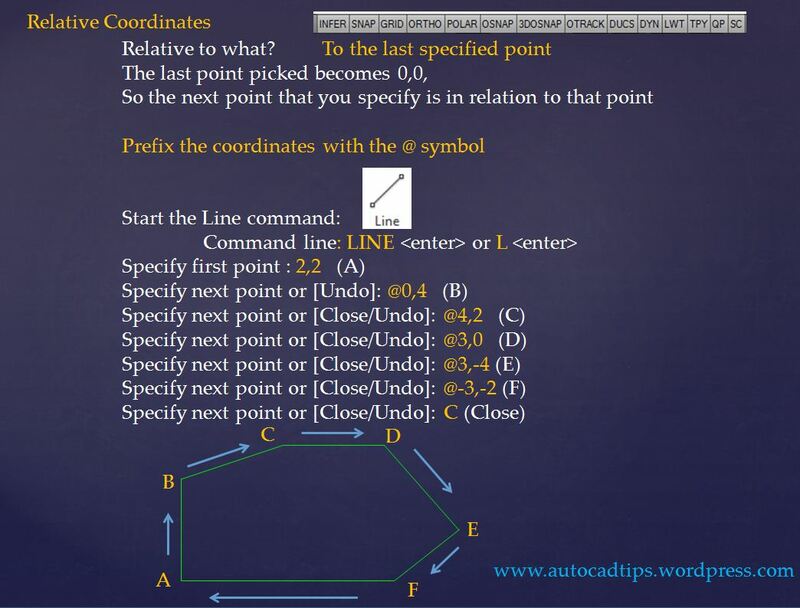 As shown above, Relative coordinates use the @ symbol when specifying a point. As shown in the picture below, relative polar uses the # symbol to specify the LENGTH of the object followed by the < symbol to specify the angle. 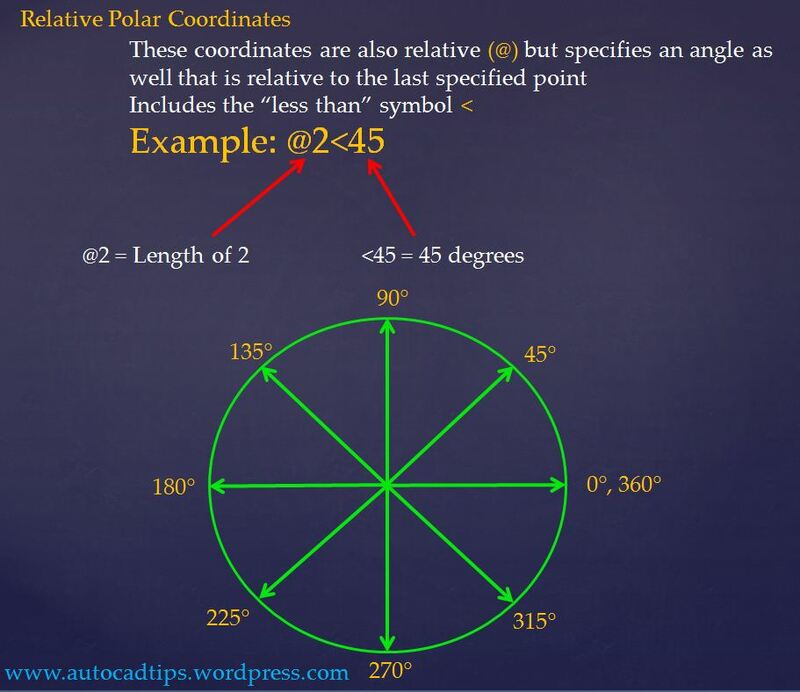 Use the below picture to create the shape that is shown using Relative Polar Coordinate entry. Turn off all toggles in the drafting settings. As I have mentioned before each exercise, Dynamic Input when enabled turns your entry method to an automatic Relative Polar method. This is confusing because when DYN is turned on and say that you want to specify the coordinate of 0,0 you will not see anything happen. 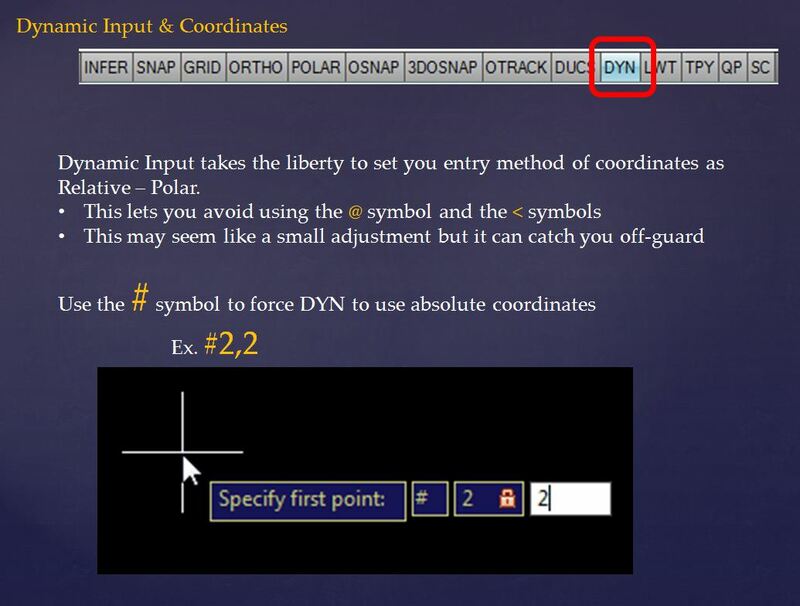 So in order to force Dynamic input to use Absolute coordinates use the # sign before the coordinates. 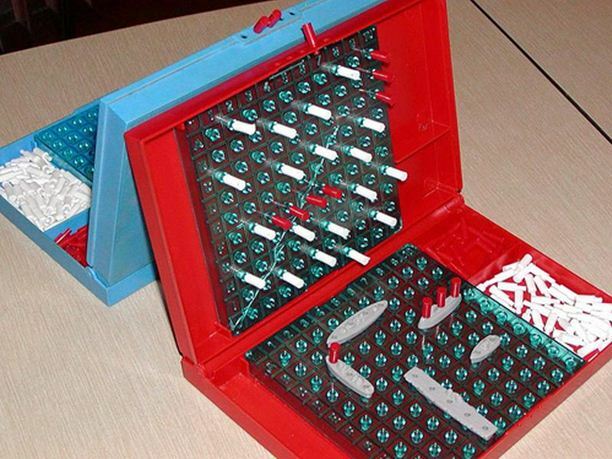 This entry was posted in BASICS, Settling In, Uncategorized. Bookmark the permalink. How to use absolute coordinates in a script? It does not work, even when using “#”.